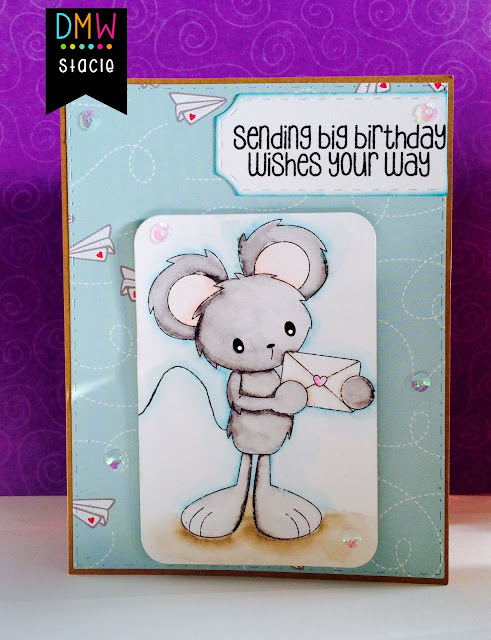 Stacie here with a quick birthday card! I am always in need of cute birthday cards! Be sure to check out DMW's new fan Facebook page if you haven't already! We would love to see your makes with these awesome digis! Today's project is this adorable Panda which is one of the Alphabet files. Be sure to visit our Facebook Members page. We're so close to 100 members. I'm sure there'll be another freebie once we reach that number. 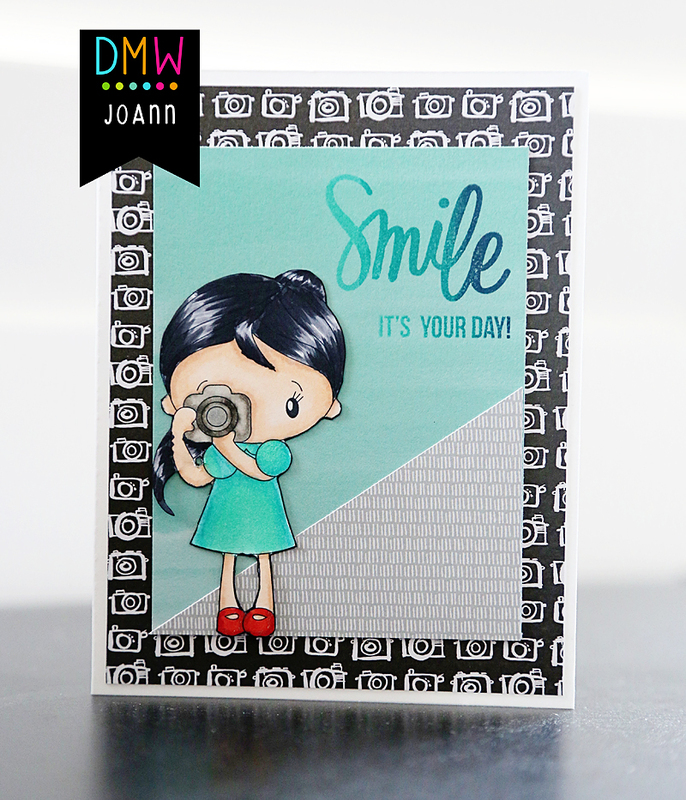 We would love to see YOUR creations using DMW stamps, print and cuts, or clip art. Hi everyone! 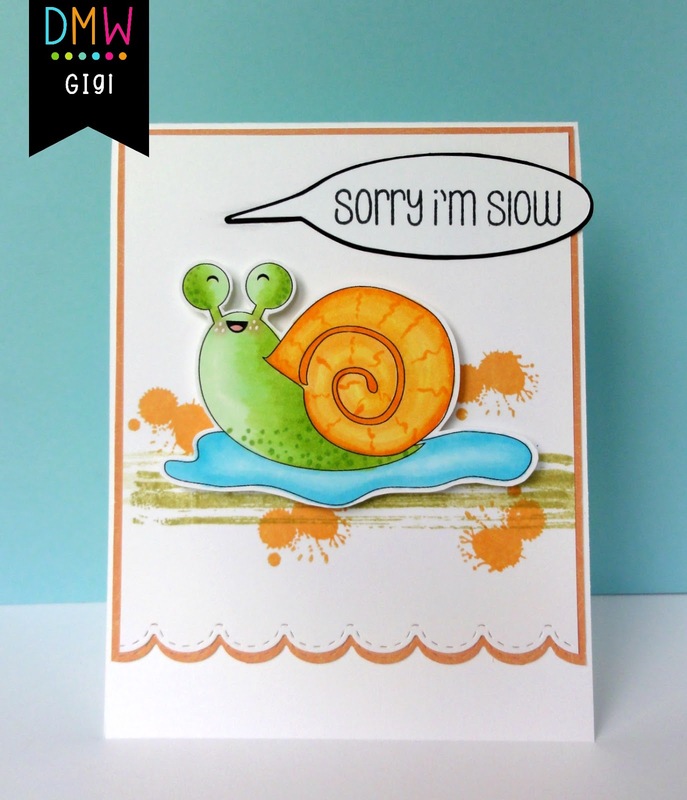 This is GiGi from The Cricut Bug and I am sharing this cute card I made using the Snail digital stamp. This card turned out so cool! I love how the Paint Splatters look on the background with that cute snail! I started this card with a standard A2 size card and added the matted pieces I cut with the Border Dies to get the scallop bottom. 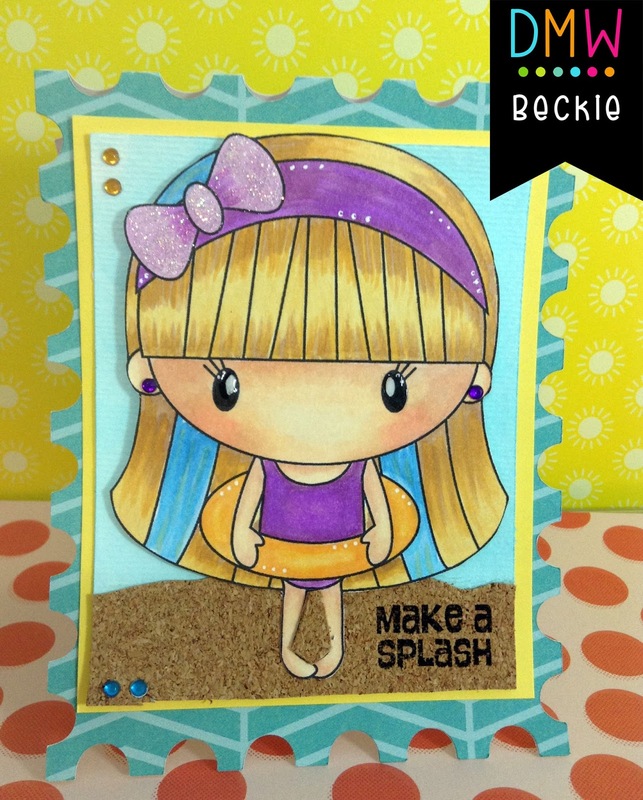 I stamped the background with the Paint Splatters and Paint Splatters 2 stamp set. 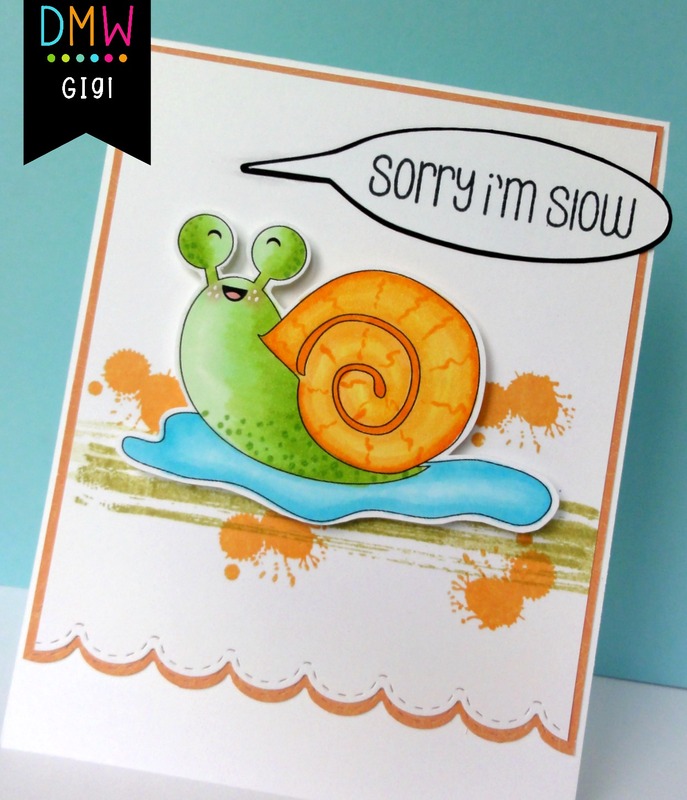 I printed and cut out the Snail with my Cameo and colored it with Copic Markers. I added it on pop dots over the splatters. I cut the conversation bubble using the SVG Cutting Files Super Action Bubbles and stamped the sentiment into the center using the JB Funny Mail stamp set. Who doesn't love to blow some bubbles!! 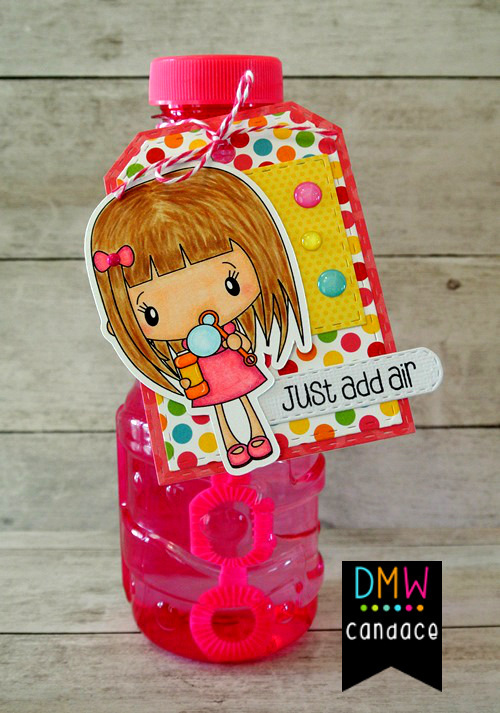 Made a card with this girl as I thought the large bubble she was blowing made a great space for a sentiment. Adding a tag around a bottle of bubbles makes for a cute gift! 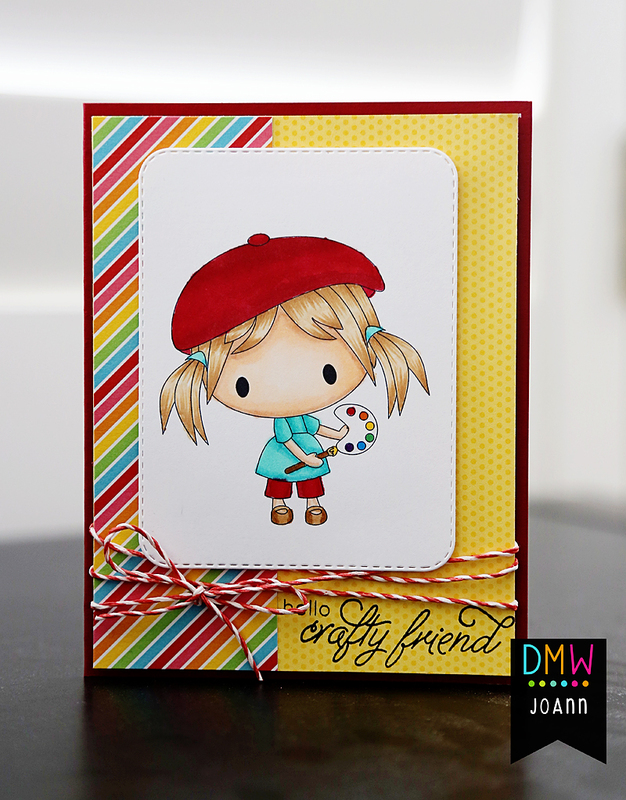 JoAnn here from JoBoogie Stamping and I've got a super simple card to share with you today using the super cute Chibi Artist! I thought I would create a bright and colorful card to highlight this adorable image. :) It's always nice to have cards for our crafty peeps on hand - you never know when you need to brighten someone else's day! 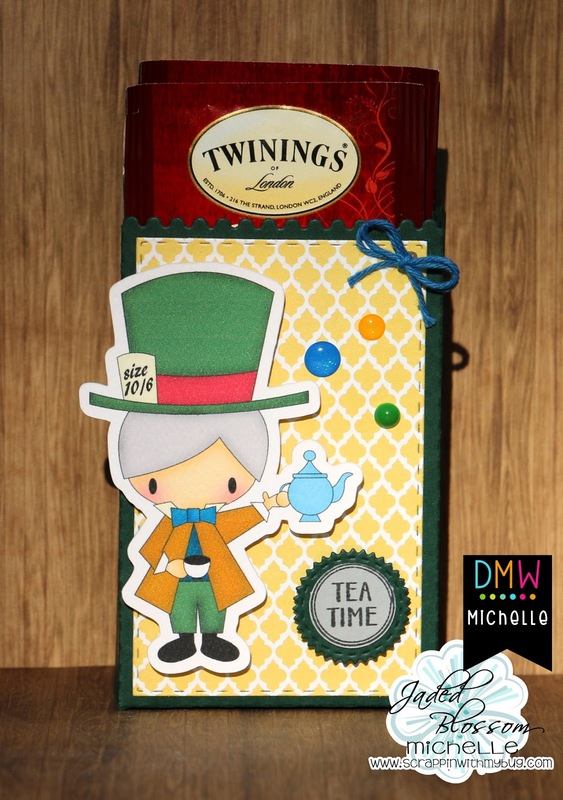 Be sure to stop by my blog to find out more on how I created this card. :) Thanks for stopping by today! Have a wonderful rest of the week! 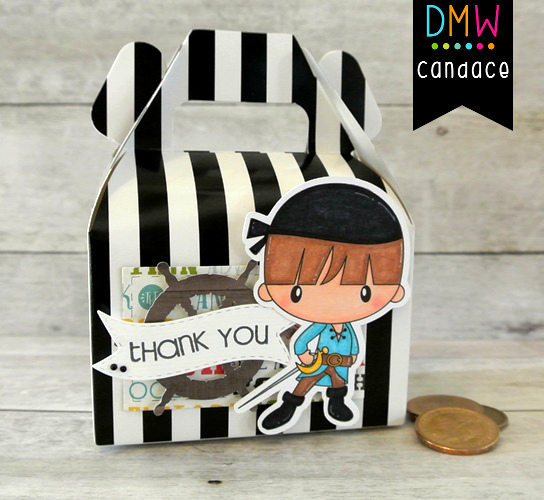 Today I am sharing a cute little caddy gift I made. I grew up in South Florida. My brother was an excellent surfer. Oh to be so young again. Don't forget to check out the ALL NEW DMW Facebook Members Gallery! Share your projects using DMW images and get free files exclusive to this gallery too! I used a combination of Copics and Spectrum Noir Markers. She is floating along on the wave die and cloud dies from Jaded Blossom. Stacie here with today's post! I just love these frozen treat digis that were released in June! They are so cute & so much fun to use on cards! 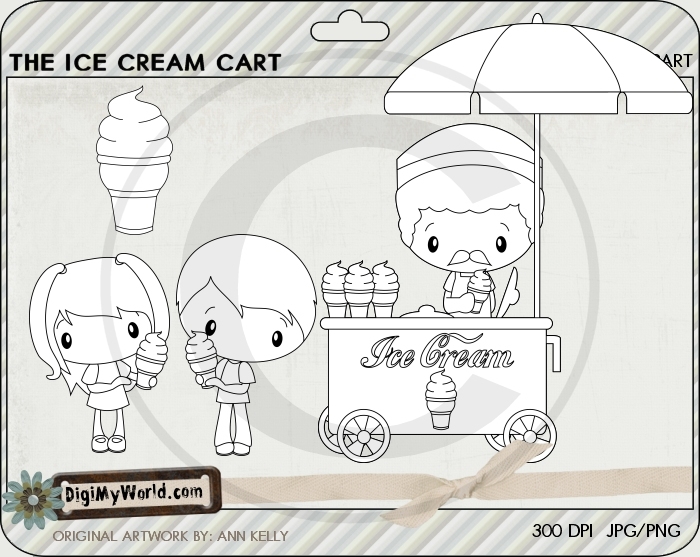 Today I'd like to share one of the images from the Ice Cream Cart set. Here's the entire set - so much fun! I used Copic markers to color the image and then cut it out using Jaded Blossom's new Stitched Circles die set. 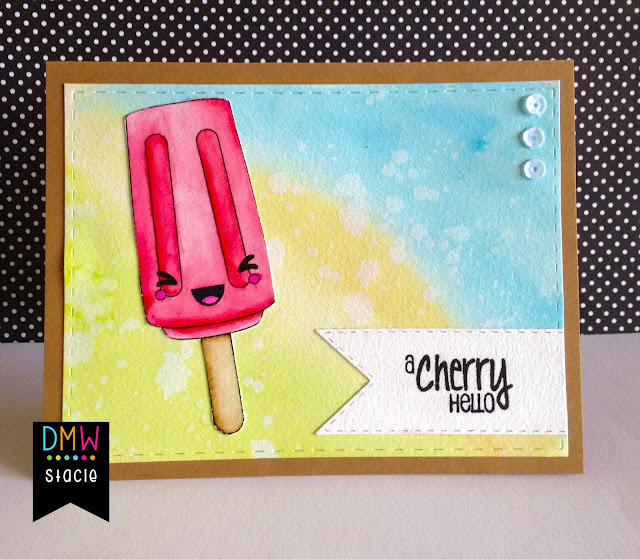 The sentiment (JB Ice Cream Kit) is stamped on the Flag Dies and the sticker and paper is from Doodlebug Designs. I hope you've signed up for our new Facebook Fan page. 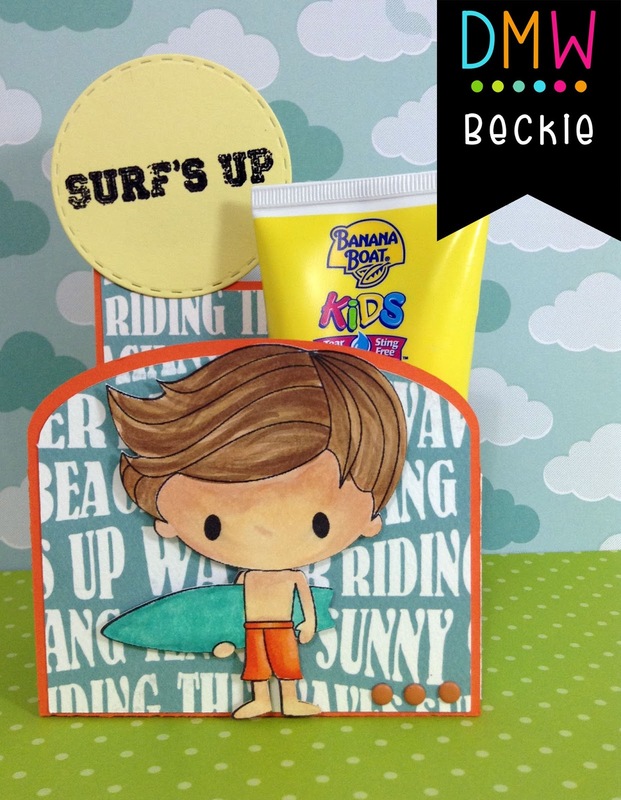 It's a place for YOU to share your creations using DMW clip art, print and cut, and digital images. Be on the lookout for freebies and contests as well. You can become a member HERE. Hi everyone! This is GiGi from The Cricut Bug and I am sharing this cute card I made using the Pea Pod digital stamp. 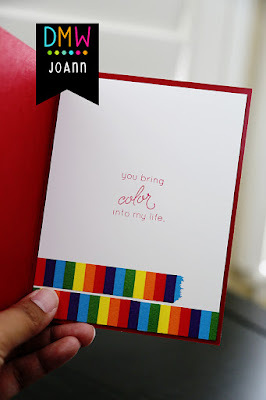 I made this card special for my cousin who just had a baby. That little Pea Pod baby is just too cute! I printed and cut the Pea Pod using my Cameo and colored it with Copic markers. I mounted it to a square mat that I cut with the Jaded Blossom Card Mat Dies. I cut the circles with my Cameo and the scallop edges with the Border Dies. To finish, I stamped the sentiment from the Hello Hello stamp set. Hi everyone! It's Candace from Candi O. 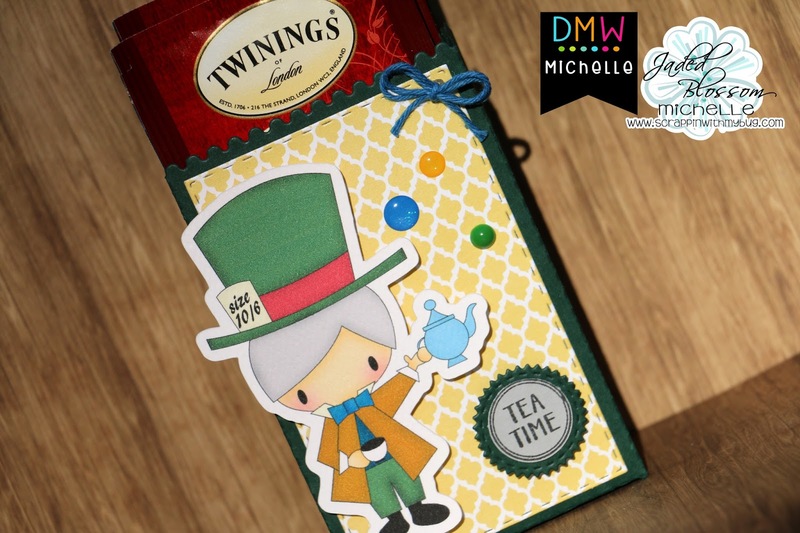 Designs and it's my first post as a Design Team member over at Digi My World. 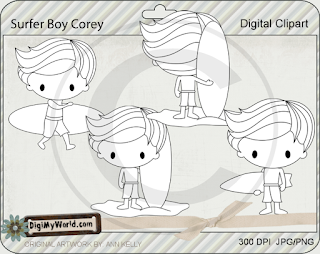 Super excited as I just love Ann's digi stamps ~ they are all so adorable! 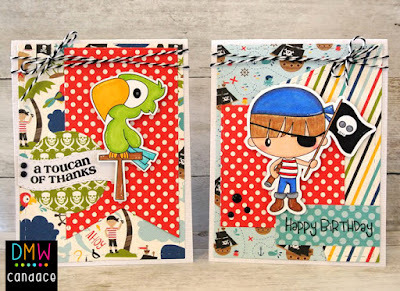 I just picked up new Pirate paper by Echo Park and knew I had to color me some Pirates!! 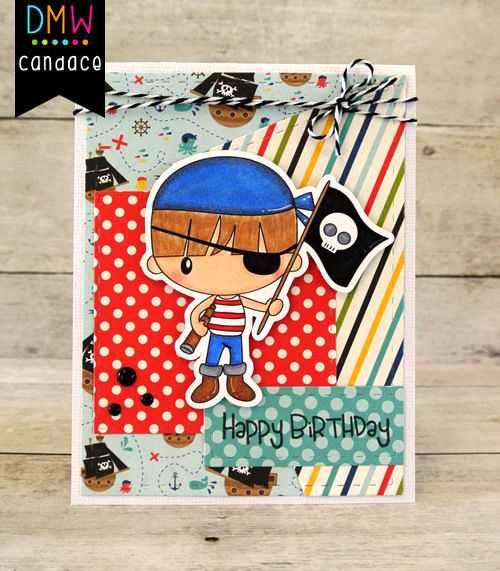 I used Ahoy Pirates - (William) file ~ lots of awesome images to color! 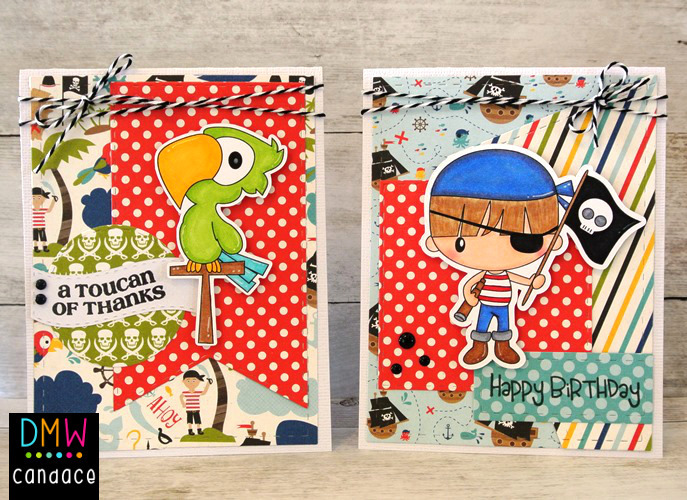 Look how fun if you used this file for a Pirate themed party! This box is a perfect thank you treat! Thanks for checking out my projects today Mateys!! For more info, be sure to check out my blog post HERE. Thanks so much taking a peek! And if you haven't already, be sure to join us over at our NEW Facebook FAN page! 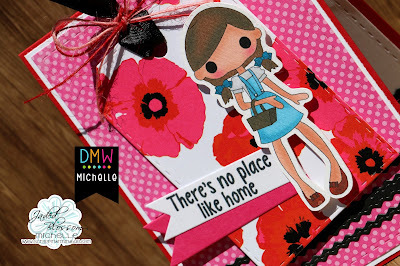 It's a place for you to share your projects made with DMW images. Come and join in the fun and be on the look out for freebies and contests. Today is my first post as a new Design Team Member. currently Cotton Candy Blue ... so this one is for her!! Join our new Facebook Fan Group! 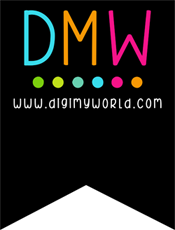 We would love to see what you have been creating with Digi My World. There's no place like home !!! Hi Everyone it Michelle from Scrappin with my Bug!!!! We now have a Facebook FAN page. It's a place for you to share your projects made with DMW images. Come and join in the fun and be on the look out for freebies and contests. Thank you for joining us during our July release week. It's not too late to enter for your chance to win our Blog Candy. You have until 11:59 PM (PST) to enter. Just follow the directions at the bottom of the post. Winner will be announced at NOON (PST) tomorrow! Here are the fabulous new images we've revealed during release week!!! All images will be available in line art and clip art. You'll find them in the store NOW. Just click each image to be taken directly to the DMW store. You may leave a comment for each day. It increases your chances of winning. We hope you're as excited about these new images as we are. 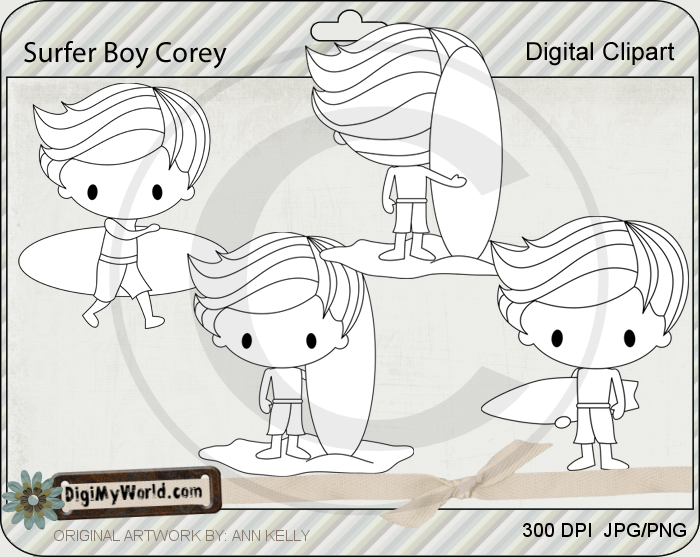 All of the images are available in the Digi My World store NOW. This will be Rene's final post for us. Thank you so much, Rene, for being a part of our team.